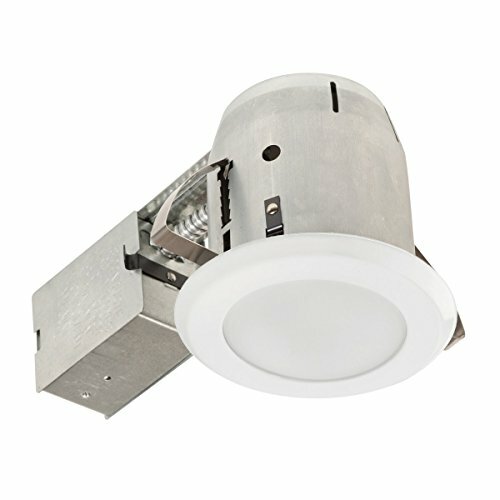 Globe Electric's 4" LED IC Rated Recessed Bathroom Lighting Kit with tempered frosted glass and glossy white finish is the perfect way to brighten bathrooms with style. Featuring patented PUSH-N-CLICK clips which are fully adjustable and extra wide to grip uneven surfaces and provide easy tool-free installation. A swivel light bulb gives you the ability to focus light on specific areas and can be directed for any desired look. An integrated cut-off switch ensures that the fixture will not overheat and can be used with or without an insulation box. Includes one 50W equivalent MR16 GU10 light bulb. Dimmable with compatible bulb and dimmer switch. About Globe Electric - since 1932 - our commitment is to our consumers, partners, associates, and our product. Every day we strive to develop and sustain the Creative energy that has kept us going for more than 80 years. Globe is a leader in high quality and innovative products; with the pace of technological change increasing globe continues to invest in research and development. Specializing in the design and manufacture of light bulbs, luminaires, and electrical products, globe has over 20 production facilities all over the world. Globe works hand in hand with the leading retailers in the world to make sure the product presentation is flawless. The recipient of numerous achievement and design awards, Globe Electric Works tirelessly to design and manufacture products that deliver beautiful appeal, stellar performance, easy installation, and exceptional value. Globe Electric - the Creative energy Company.